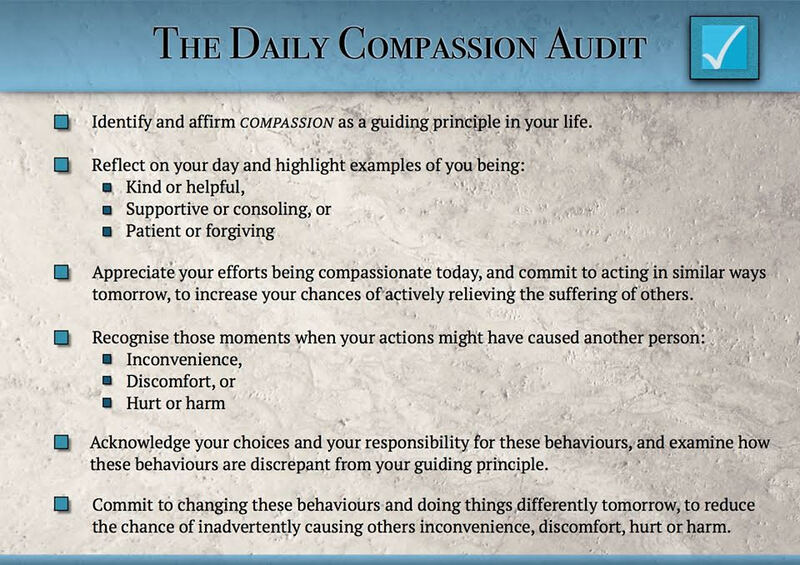 The Daily Compassion Audit: A Self-Check to Minimise Inadvertently Causing Suffering to Others. Compassion is the sympathetic and active alleviation of suffering in others. At the other end of the spectrum is malevolence and cruelty, intentionally causing others to suffer. But what about all the murky waters in between? I’m that guy who drives right on the speed limit. I know, I know! But it’s just what I do. One reason is that I don’t want to get any more fines! But also, I figure that it’s probably safer, especially now I carry around precious cargo. Today, I was driving along a main street on the outside lane when a hotted up, lime green ute came speeding up behind me and then sat aggressively right on my tail. I could see the driver in my rear vision mirror yelling angrily at me through his goatee, but I couldn’t move across straight away. I must admit, I got my back up a little bit and rather stubbornly stayed on the speed limit (well, maybe I slowed just a little) in front of him. He tried to dodge and weave, changing lanes suddenly, but then got stuck behind a bus while I continued to cruise along. At the time it felt almost satisfying. But it only took a few minutes for me to start to think about what might have been going on for him, why he might have been driving fast, where it was he needed to go. I started to regret my actions. Maybe I should have simply moved out of his way and let him pass. A little further into my journey, on the highway by now, I was once again on the outside lane driving at the highway speed limit. Again a vehicle came speeding up behind me, this time full of four young men and stacked high with surfboards. Given the earlier experience, and following a deep, calming breath, I moved out of their way and watched as they went hurtling past. Then I got thinking again. They really were travelling fast. What if they have an accident? What if on this occasion I should have stayed in front of them, kept to the speed limit and kept them more safe? Doing the right thing can be complicated sometimes. So here we are, in the murky waters between compassion and cruelty, the “in-between”, where one human being might inadvertently, accidentally, thoughtlessly or perhaps carelessly cause suffering in another human being. I’ve been wondering that perhaps this “in-between” is a result of the constant conflict that we all endure between living a good life and a life that feels good. I can only assume that by far the vast majority of people don’t want to cause suffering in others? I suppose there is a small and unfortunate minority who may enjoy causing suffering, but mostly we want to live a good, decent, moral life. But we also want to live a life that feels good. We have aspirations and seek gratification, and generally these are driven more by self-interest or interest in those very close to us, rather than an interest in others. Self-interest is not inherently bad. In fact, it’s inherently human, and got us where we are today. But self-interest does motivate people to persist with certain behaviours despite the possible harm they cause others. There are many day-to-day examples of putting self-interest ahead of interest for others: parking in a disabled parking space, putting rubbish in a donations bin, yelling at the teenaged waiter for the food not being cooked right, or opportunistically jumping a queue because someone wasn’t watching and left a gap…just to name a few. And there are societal concerns as well. Fast food causing obesity, tobacco smoking causing cancer, alcohol misuse causing accidents, poker machines causing financial devastation and legal problems. 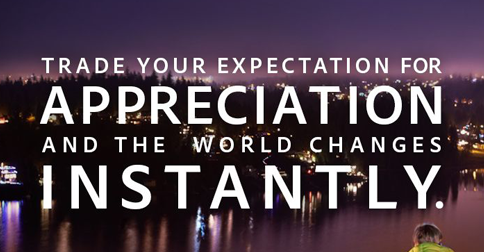 In all these areas, one person’s gain can be (often is) another person’s suffering. In that vast range of possibilities between compassion and cruelty, I began to wonder, how did I do today? I certainly wasn’t perfect, but nor was I the other extreme. So, bearing all of this in mind, let’s do a bit of a compassion audit and check to see whether your day was in the black. So, how did you go today?